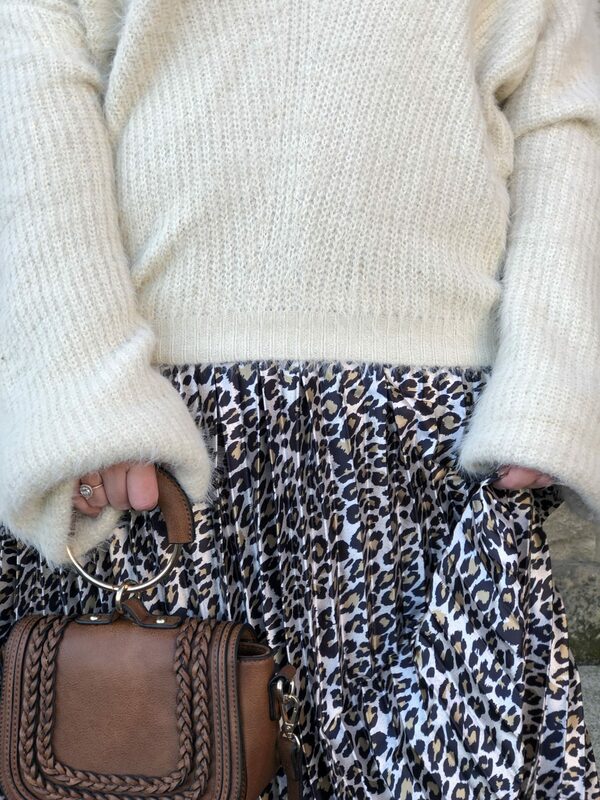 Styling A Leopard Print Pleated Midi Skirt & Challenging Myself To Try New Styles! 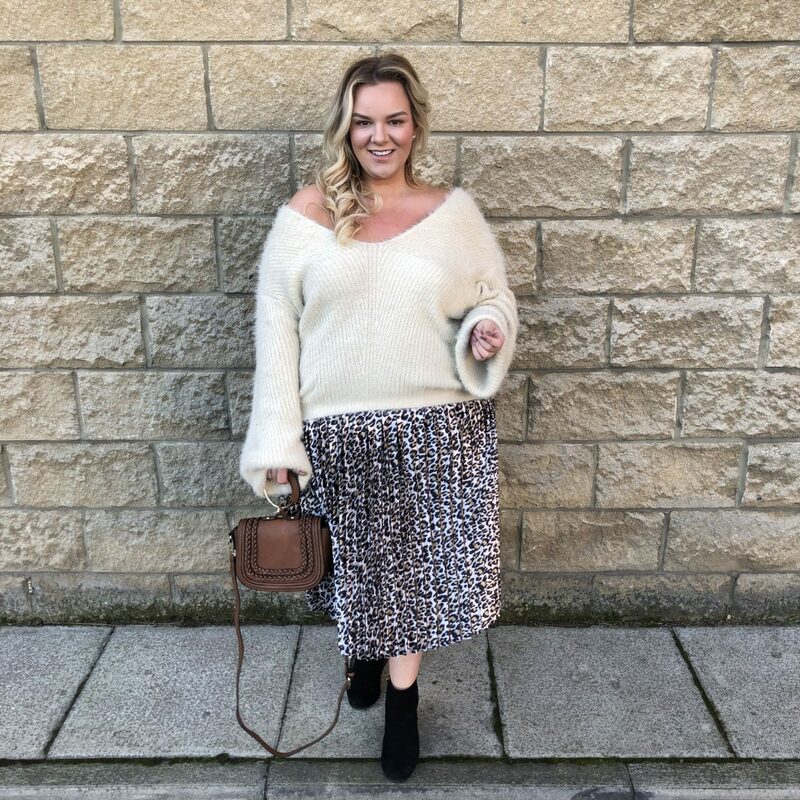 A leopard print pleated midi skirt is one clothing item that I did not think that I would find myself styling yet here I am, absolutely rocking it – AND loving it. I have found that it looks great with a jumper, cami or t-shirt and my faux leather jacket when I’ve played around with styling it at home and it’s so easy to accessorise too with handmade leather bags, ankle boots, strappy heels or flats and even a baker boy hat would look cool with I think. It’s amazing what a little bit of courage to try something new can do and let me tell you ladies, it does wonders for your body confidence too! I hate to tell you this ladies but if you’re waiting for some pretty little wardrobe fairy to swoop down and swish their wand over your outfits, you’re going to be waiting A LONG time. Fashion and styling doesn’t come easy to everyone; I can say that because I’m one of those people. It took me a long time to find what I felt truly me in (the lack of plus size clothing shops made that so tough when I was younger) and even now I couldn’t tell you what was on the catwalks because if truth be told, I’m not really bothered. I’m all about how I FEEL in my clothes; comfortable, happy and confident, rather than what I’m actually wearing. I don’t live in fear of what other people will think about me in my outfit & as such, I don’t stick to these imposed fashion rules; I wear what I want, when I want and to hell with what anyone else thinks. That outlook came with time. I pushed myself to try new things and really treasured the happy, excited feeling that came with wearing an outfit in a new style. You don’t need anyone to give you the confidence to do that, you need to find it in yourself. I’m still pushing myself now. Skirts are an item that I have hardly ever worn, even at school. I have always been a trousers/jeans/leggings or a dress girl but last autumn, I felt inspired to order a faux leather mini skirt and I loved it from the moment I first put it on. That one was in black, then I got a similar length short skirt in khaki and now I’m trying out the pleated midi skirt which is something that I never thought I’d find myself typing! I’ve always associated pleated midi skirts with my late grandmother who was certainly a fan of them but I’ve been seeing them styled so often in a way that appeals to me that I thought it was worth taking the plunge and ordered one for myself, whats the worst that could happen huh? 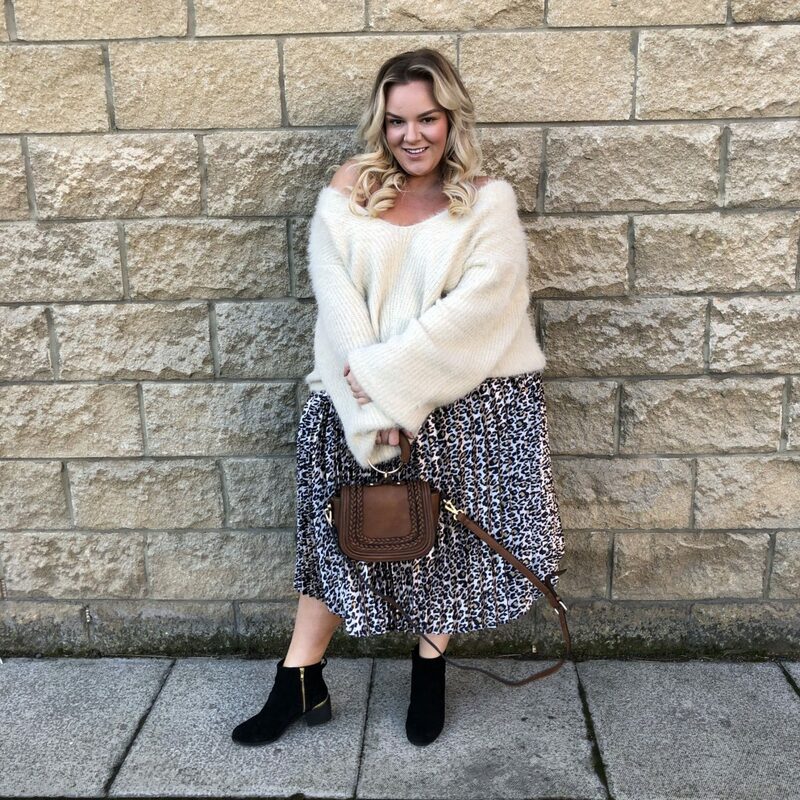 The Leopard Print Pleated Midi Skirt from PrettyLittleThing Plus Size is an absolute beauty, so much so that I’m tempted to buy more of their midi skirts. The shape is cut beautifully and the shiny, satin-like fabric is absolutely stunning; I love the way that it has a shimmery sheen to it that is in no way over the top. It could be easy for a skirt like this to look too out there but it doesn’t at all. I’ve worn this look twice already and received so many compliments on it so its nice to know that others liked how I styled it with the cream eyelash knitted jumper as well, especially when worn off the shoulder. Ankle boots and a bag that can be held by the hand are the perfect accompaniment for this look. I’m really excited to have a go at styling this skirt out and about in different ways. I have a forest green t-shirt that I’ve tried on with it and it looks LUSH but before I wear that out, I’m first going to try it out with a black cami. I have a v neck one that I think will look awesome tucked into the skirt, especially with my faux leather jacket over the top of it. I’ll be sharing the finished look over on my WhatLauraLoves Instagram page so be sure to follow me there to see how the look comes together. I think this pleated midi skirt is going to be something that I can wear with a number of different pieces from my wardrobe. I’m so pleased that I took the plunge and gave a pleated skirt a go, its great to discover new pieces to feel comfortable and confident in! 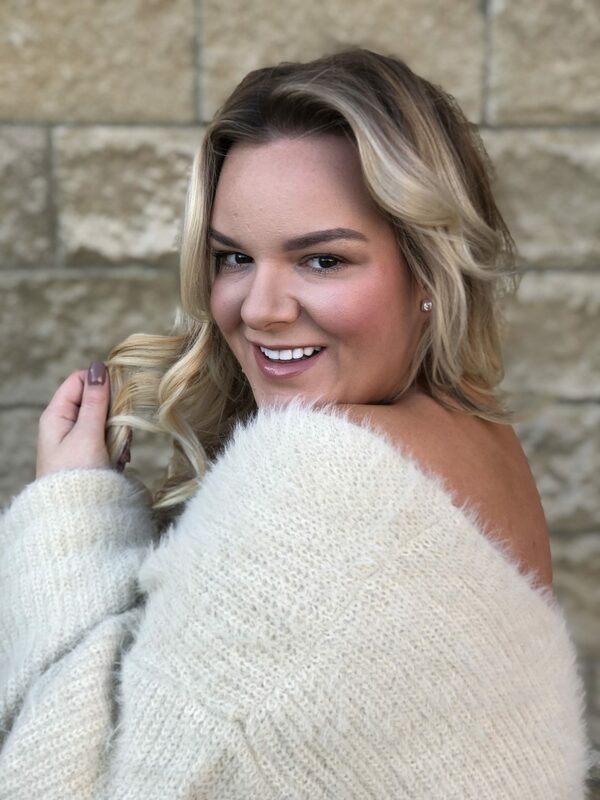 Challenge yourself to give something new a try and with time, you’ll be opening the doors to an entirely new wardrobe filled with pieces that boost your happiness when you wear them. Gone will be the days of hiding behind black tents to try to make yourself invisible. Stand out and be proud of who you are. 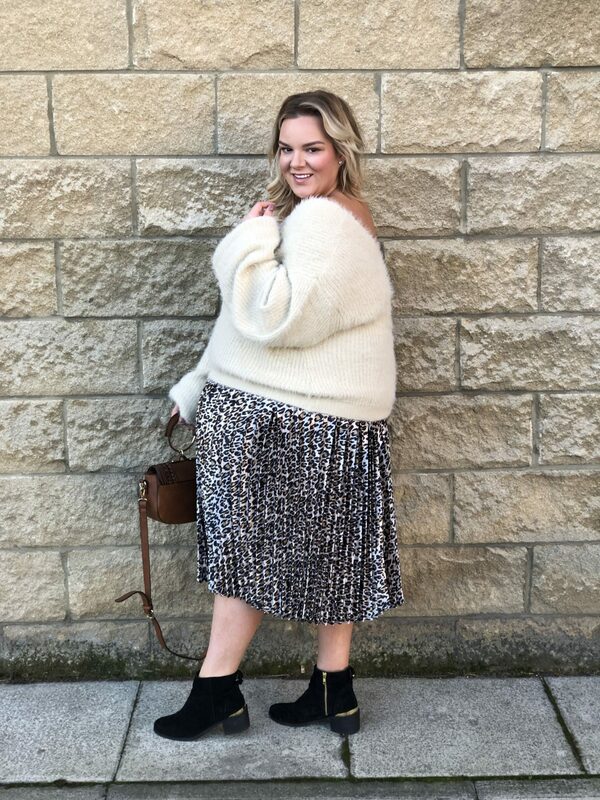 I love how you have styled that skirt, the jumper looks so warm and cosy I could totally think about wrapping up in it right now as I am frozen. Love a well styled leopard print – some people can wear it, some can’t – you clearly belong to the leopard ladies! You look gorgeous as always Laura. The skirt is lovely and I really love the jumper too, such a cosy look for this time of year. Looking stunning, as always, Laura 🙂 I absolutely LOVE the skirt. Leopard print is really on-trend right now!